October 6, 2017 – The discovery of evidence for ancient sea-floor hydrothermal deposits on Mars identifies an area on the planet that may offer clues about the origin of life on Earth. A recent international report examines observations by NASA’s Mars Reconnaissance Orbiter (MRO) of massive deposits in a basin on southern Mars. 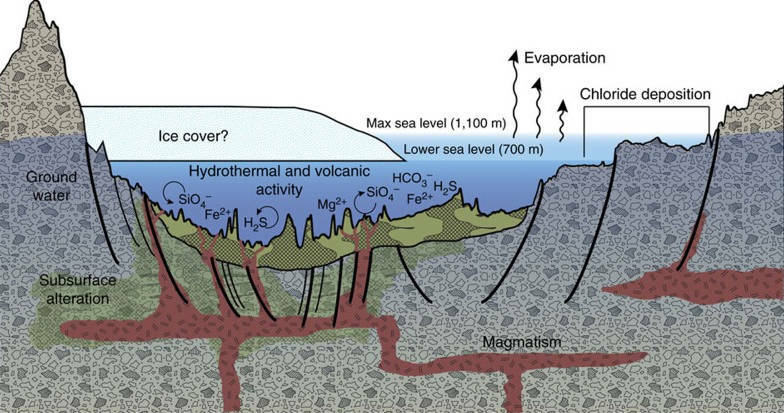 The authors interpret the data as evidence that these deposits were formed by heated water from a volcanically active part of the planet’s crust entering the bottom of a large sea long ago. Mars today has neither standing water nor volcanic activity. 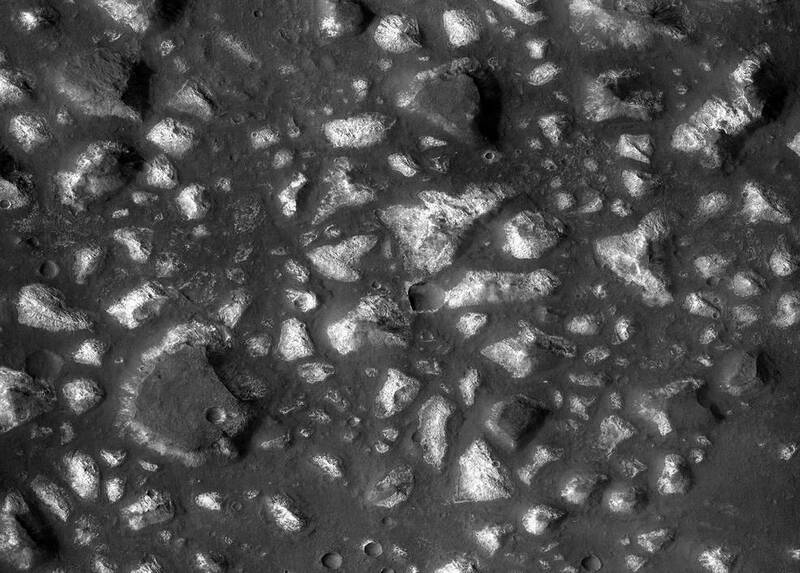 Researchers estimate an age of about 3.7 billion years for the Martian deposits attributed to seafloor hydrothermal activity. Undersea hydrothermal conditions on Earth at about that same time are a strong candidate for where and when life on Earth began. Earth still has such conditions, where many forms of life thrive on chemical energy extracted from rocks, without sunlight. But due to Earth’s active crust, our planet holds little direct geological evidence preserved from the time when life began. The possibility of undersea hydrothermal activity inside icy moons such as Europa at Jupiter and Enceladus at Saturn feeds interest in them as destinations in the quest to find extraterrestrial life. Observations by MRO’s Compact Reconnaissance Spectrometer for Mars (CRISM) provided the data for identifying minerals in massive deposits within Mars’ Eridania basin, which lies in a region with some of the Red Planet’s most ancient exposed crust. Niles co-authored the recent report in the journal Nature Communications with lead author Joseph Michalski, who began the analysis while at the Natural History Museum, London, and co-authors at the Planetary Science Institute in Tucson, Arizona, and the Natural History Museum. The researchers estimate the ancient Eridania sea held about 50,000 cubic miles (210,000 cubic kilometers) of water. That is as much as all other lakes and seas on ancient Mars combined and about nine times more than the combined volume of all of North America’s Great Lakes. The mix of minerals identified from the spectrometer data, including serpentine, talc and carbonate, and the shape and texture of the thick bedrock layers, led to identifying possible seafloor hydrothermal deposits. The area has lava flows that post-date the disappearance of the sea. The researchers cite these as evidence that this is an area of Mars’ crust with a volcanic susceptibility that also could have produced effects earlier, when the sea was present. The new work adds to the diversity of types of wet environments for which evidence exists on Mars, including rivers, lakes, deltas, seas, hot springs, groundwater, and volcanic eruptions beneath ice. 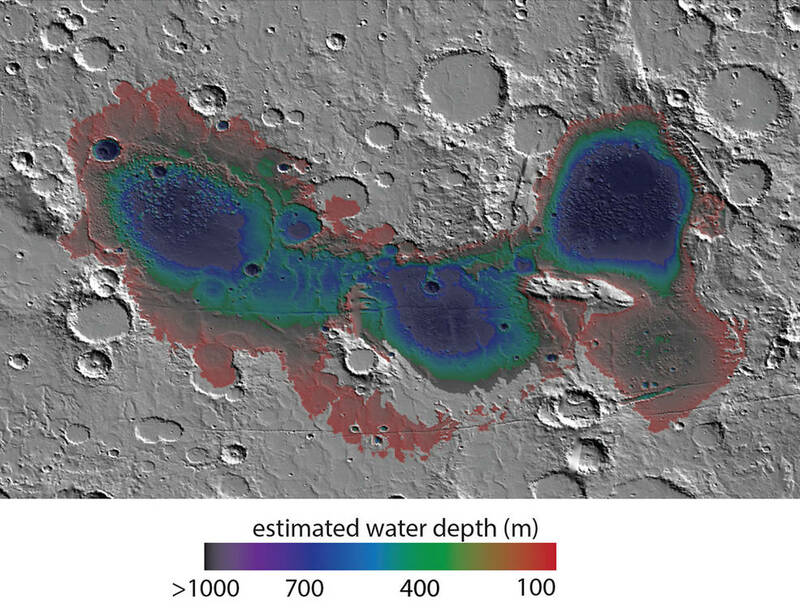 “Ancient, deep-water hydrothermal deposits in Eridania basin represent a new category of astrobiological target on Mars,” the report states. It also says, “Eridania seafloor deposits are not only of interest for Mars exploration, they represent a window into early Earth.” That is because the earliest evidence of life on Earth comes from seafloor deposits of similar origin and age, but the geological record of those early-Earth environments is poorly preserved. The Johns Hopkins University Applied Physics Laboratory, Laurel, Maryland, built and operates CRISM, one of six instruments with which MRO has been examining Mars since 2006. NASA’s Jet Propulsion Laboratory, a division of Caltech in Pasadena, California, manages the project for the NASA Science Mission Directorate in Washington. Lockheed Martin Space Systems of Denver built the orbiter and supports its operations.